Summer is in full force here in the sunny South, with the heat and humidity both turned up to 11. We are still a month or so away from the “dog days” of summer, those dry, brown, heat-baked days when the only sound is the rising and falling hum of the cicadas and only movement is the rippling of heat on the horizon. We are still in July – hot, steamy, and oppressively sticky. People retreat indoors and only emerge in the early morning and evenings. You break into a sweat walking from the house to the car. In spite of the syrupy sticky air, I have been training consistently for my upcoming half marathon in August. The no-see-ums are out in force, which means I have to run earlier in the evening while it is still really hot, rather than around sunset when it is only regular hot, to avoid coming home with hundreds of little bugs stuck to me. (That only had to happen once to make me adjust my running routine, believe me!) But training in the heat has paid off and I feel that I have finally acclimated to it. Sure, I still get hot and sweaty when running, but I don’t feel like I am being roasted from the inside anymore. I have worked up to 12 miles, which was fairly excruciating in the heat, and have another 12-miler and a 14-miler scheduled, with fallback weeks in between, before my half marathon, so I should be well-prepared. Unfortunately, I had to miss my fallback long run this past weekend – I have had an energy-sucking cold for a couple of days. But my new run-every-other-day routine has made training enjoyable, and my nearly vegan diet has substantially reduced my recovery time after runs. But summer hasn’t been all running. Work has settled into a comfortable pace, leaving me with plenty of energy for other things. And there have been lots of other things going on! 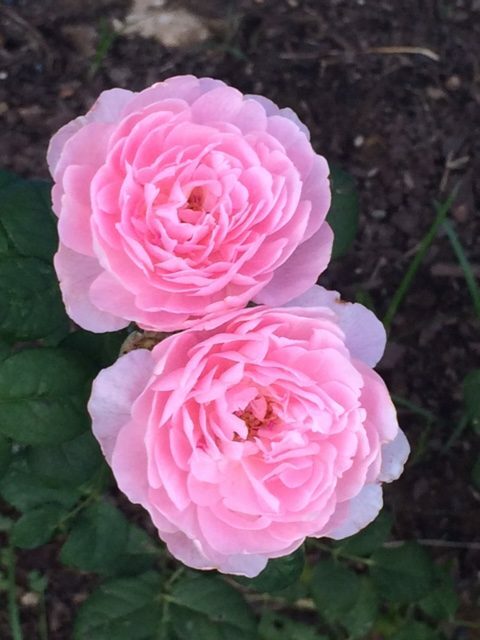 I have spent time working in, and enjoying, my rose garden, which is currently producing sporadic summer blooms among the English roses, such as these lovely blossoms from “Queen of Sweden”. She, Darcey Bussell, Olivia Rose Austin, and The Alnwick Rose have been my most prolific bloomers so far. Redoute got a late start, but has also turned into quite the bloom machine. I never got around to ordering and installing an irrigation system for the new rose bed, but luckily we have had so much rain this year that it hasn’t been necessary. We have also had the opportunity to enjoy a couple of concerts this summer. Last week, we saw Duran Duran at Nashville’s new Ascend Amphitheater. It was a wonderful concert. When the lights went up on Simon Le Bon and John Taylor, I surprised myself by screaming like a 15-year-old girl. I guess 15-year-old me had been waiting a long time for the chance to see Duran Duran! Of course, we were on the lawn in the back, singing along at the top of our lungs with everyone else. Bad storms delayed the start of the concert by nearly and hour and half, but we stuck it out in the mud. The opening band was Chic, and they were phenomenally good – a wonderful group of musicians with an extensive catalog. This week, we are going to see Weezer at the amphitheater. I have been looking forward to this one for months! It is nearly impossible to get tickets to a Weezer concert and I barely managed to score a pair for Steve and I. Geek rock! On the home front, we have not had a chance to get much more work done in Joshua Becker’s “Uncluttered” course, after our initial successes. We plan to pick up with the kitchen, once we finally have an opportunity to work on it. I have also finally begun to readdress The Great Coat Closet Remodel Project. We planned to finish the drywalling this past weekend, but instead I spent most of the weekend in bed with a cold. I had been trying to cobble together the remaining drywall from scraps, but this turned out to be extremely frustrating and exhausting. So, I broke down and purchased some new sheets of drywall, so I can finally finish. With the hot, humid weather in full swing, this is a great time to get some indoor projects done.